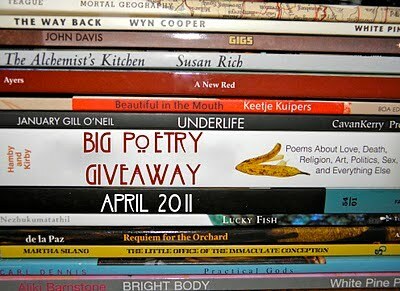 This year, I’m celebrating the Big Poetry Giveaway 2011 organized by the lovely and talented Kelli Russell Agodon. Instead of two books, I will be giving away three! All you have to do is leave a comment to let me know that you want your name thrown in a hat (or in a random number generator — I have to figure out how to use that!). Make sure that you leave contact information, if you don’t have a blog! 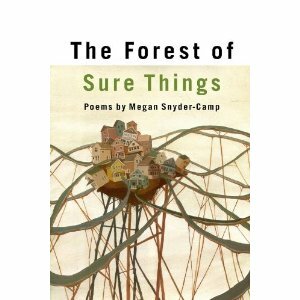 Book Number One: The Forest of Sure Things (Tupelo Press 2010) by Megan Snyder-Camp. 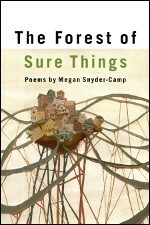 Winner of the Tupelo Press/Crazyhorse Award, Megan Snyder-Camp’s surreal story of a new family settling into a remote village on the Northwest Coast. Not a straight narrative of the past, this book is layered with contemporary looks at what it means to be a wife and mother in today’s world. A great read! 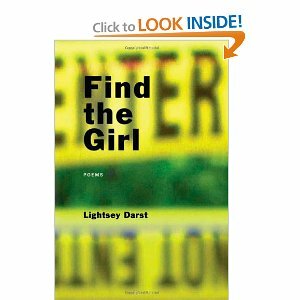 Book Number Two: Find the Girl (Coffee House Press 2010) by Lightsey Darst. If you are a fan of Temper by Beth Bachmann or I Have to Go Back to 1994 and Kill a Girl by Karyna McGlynn, Find the Girl may be for you! 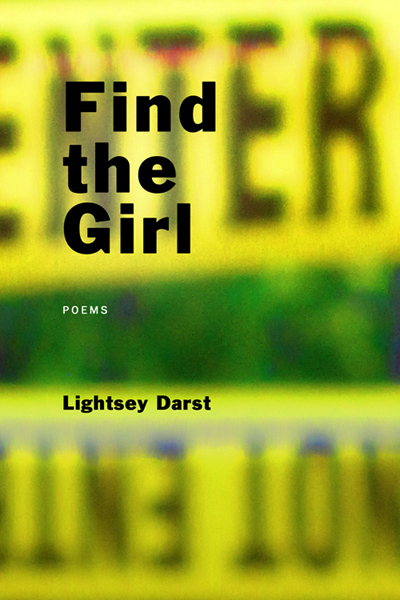 And besides, Darst’s book is one of the few poetry books to actually make the pages of Entertainment Weekly — can you believe that?!!! Book Number Three: How the Crimes Happened (Cavankerry Press) by Dawn Potter. Potter’s work was new to me, and I was glad I picked up her newest book, which is a great collection of works that explore loss and love in their complicated and often, frustrating forms. Again, please leave a comment if you would liked to be entered! I’m in the middle of spring break here, but I haven’t really had much of a “break.” I got back from PCEA yesterday, and I have spent a greater part of today thinking about how time changes. I haven’t been to a PCEA conference in about 10 years, and back when I last attended, most sessions were geared towards scholarly work, which is fine, but sometimes hard to follow when one is a member of the audience. This year, however, I was pleased to see the number of sessions geared towards creative works and pedagogy. I ran into some old friends. I got to meet writers Erin Murphy and Iris Jamahl Dunkle, (whose website appears to be down, so I linked to some of her poems) poets who are currently dabbling in creative nonfiction. Furthermore, I sat in on an excellent session on Saturday morning that discussed pedagogy. One presenter talked about teaching humanities in a digital age; another talked about using Russian formalism to help children critically read texts, including Clifford and Franklin (I don’t have kids, so I was a bit surprised, but pleased, to find out that children read Clifford). I found the second presenter’s mention of Vladimir Propp’s theories about folklore and fairy tales fascinating, and couldn’t help but think of Sandy’s latest discussion about fairy tales. Overall, it was interesting to me how much discussion focused on technology and informational literacy. I am getting old, I am afraid, because when I first started attending conferences, technology was throwing a VHS movie in during class time or maybe using Power Point. There’s so much out there, so much to learn. It was pointed out that so many campuses insist that today’s students know everything about informational literacy and technology, which, as one presenter pointed out, simply isn’t true. A young woman in the audience who said she was a student (undergraduate or graduate, I’m not sure. She was probably in her early 20’s) said that she felt very overwhelmed about all the “technology” out there. And just the other day, I had a whole bunch of students tell me that they wish teachers would go back to the chalk and blackboard and not use so much technology in the classroom. Are we incorporating technology in the classroom because we believe that is what today’s students know or want? How much is too much? I’m afraid there are probably professors and teachers out there who use technology for the sake of using technology, and that’s it. I know that I am not one of them (I still fumble with the DVD player in class). I wonder what will change in another 10 years…. This week marks the 100th anniversary of the Triangle Shirtwaist Factory Fire. In the past week or so, I have thought a lot about this anniversary and about writing a post about its importance in labor history. But then, I saw Kathy Newman’s post on Working-Class Perspectives and knew right away that I didn’t have to say much….she said it all. Or almost all. I have to add that it seems today that with so much backlash against unions, that we are forgetting the good unions did, and still do, and have yet to do. I won’t talk politics here, except that to say, if we lose unions, we may lose fire escapes. And then, we may lose even more. And as human beings, we can’t afford to lose more. You may connect the metaphors. Of course, this would not be a literary blog if I didn’t mention the Triangle Fire in literature. Janet Zandy and Nicholas Coles, editors of the anthology, American Working-Class Literature explain, “More than a single tragic event, isolated in the past, the Triangle Fire has also inspired contemporary poets, writing independently of each other, to return to the 1911 newspaper accounts, photographs, court testimonies, artifacts, survivors’ stories, and even the still-standing building to re-create the event for a new generation of readers. ” You can read Mary Fell’s work about the Triangle Fire here. Chris Llewellyn’s Fragments from the Fire is also a great book. Of course, these are not the only two poets to write about this tragic event. If you want to read more about the fire in poetry, Zandy’s excellent article, “An Essay About Triangle Fire Poetry” is found here. Fiction writers have also ventured into the world of the Triangle Fire. Katharine Weber, whose grandmother finished button holes for the Triangle Company, wrote Triangle, a novel that explores the story of the last survivor of the infamous fire. This past year, I also finished two young adult books, Ashes of Roses by Mary Jane Auch and Uprising by Margaret Peterson Haddix, which were excellent reads. Last year, poet Kelli Russell Agodon organized the Big Poetry Giveaway where participating poets and bloggers offered free books of poetry to the world. Last year at this time, I was in the middle of buying a house and moving and couldn’t take part in all the fun. This year, however, I plan to join in! Stay tuned to this blog, but also take a look at Kelli’s announcement. For the last week or so, I have followed a swollen river to work. The Conewango flooded last Friday morning and it has been shrinking very slowly. Homes have been underwater, along with camps and vehicles. Children’s tire swings and woodpiles left from the winter. I don’t have to write that this scene reminds me of Japan. All of you watch the news, have seen the pictures, have read the headlines. Still, today the sun is out — we have hit sixty degrees here in rural Pennsylvania. Anthony and I opened our Florida Room, and the cats had a ball chasing each other in the warm sun and watching the bluejays that are hanging out in the pine trees that line our backyard. I got my contributor’s copy of Cave Wall in the mail today, and am enjoying the poems that have found a home next to my work — poems by some of my favorite poets, including Jim Daniels, Alison Pelegrin, and Jehanne Dubrow. Let me be selfish for just a minute and say everything is all right with the world. Everything is all right with the world. Let me say this before I go back to working my way through the pile of papers I must grade. Or before I look at the weather report. Or before I turn on the news. “I don’t suppose anyone has ever offered an in-depth study of the literary form of literary ephemera, the author dust jacket biography. But if they did, I’m sure they would notice a distinct sociological shift over the past decades.” So begins author Gerald Howard in “Never Give an Inch” an article published in Tin House’s Class in America Issue. I admit, dear readers, that when the call for submissions came out for Tin House’s issue dedicated to class issues, that I submitted three poems of working class/blue-collar nature. I did not get accepted, but still eagerly awaited my copy of this particular issue. At first, I was a bit disappointed when I opened the pages because I did not see work from some of my favorite poets of working class poetry including Jim Daniels and Jan Beatty. But I quickly warmed up to the issue. Tin House’s class in America offers a small, but wonderful selection of poetry including work from Major Jackson, Erika Meitner, and Charles Harper Webb. The issue also has fiction and reviews, but I have to admit that my favorite piece was the essay by Gerald Howard. Choosing to focus on authors’ individual biographies, Howard questions the role that working-class writers and their works will play in the literary future. He explains, “Contemporary dust jacket biographies tend to document the author’s long march through the elite institutions, garnering undergraduate and postgraduate and MFA degrees, with various prizes and publications in prestigious literary magazines all dully noted.” Besides noting the change in authors’ biographies, Howard also talks about those in history (and much of it recent history) who do write about the working-class world, discussing the influence of Bobbie Ann Mason, Dorothy Allison, and of course, Raymond Carver. I spent a great deal of time as an undergraduate studying the work of these authors, so in many ways, this particular article was a happy trip down memory lane. But Howard’s words also got me thinking about my own writing and my own biographies that I paste into my cover letters. I admit, that if I sending my poems to a journal or magazine that focuses on blue-collar creative works, I do note in my bio that I spent time as a factory worker, a waitress, a reporter. But now, I also have to admit that my bio is more the typical work that most people would read in any literary journal. I have published this, I have published there, I teach there. Stick in my award from the New York Foundation for the Arts, and there you have in: Karen J. Weyant’s literary life in a nutshell. Should I go back to my old bios? Does it matter? Or should my work really speak for itself? It’s true that I have not held a working-class job in many years, and I see the world of working class through Anthony, through my family, and through my students. So in many ways, their stories are the stories I twist and bend and mold into my poems. Yet, it’s also true that I’m not a prestigious writer, nor do I teach at a prestigious school (community colleges are on the outskirts of the academic world, outskirts I love, but outskirts, nevertheless), so I can’t say that I am lost in what might be considered the “typical” writer’s world in today’s America, either. Howard’s article didn’t offer any hard and fast answers about class issues in today’s writing. Still, it was a piece that made me think about the blue-collar writer’s place in today’s world. And because lately, I have been immersed in statistics and data and 200 page reports about education, I am glad that I had a chance to grapple with subjects — and people — that are real to me. It’s been a busy week — and I’m afraid that this weekend I am going to have to play some catchup. But I’m not so busy that I can’t provide some quick links. First, both Jeannine Hall Gailey and Kristin Berkey-Abbott have unveiled their covers for their upcoming collections. Can’t wait to read the complete works! Second, I am late to the party as always, but Eduardo C. Corral has announced that his manuscript has been selected by Carl Phillips for the 2011 Yale Series of Younger Poets. Congrats, Eduardo! Another book I can’t wait to read. Last, but not least, Michael Meyerhofer’s collection, Damnatio Memoriae, has won the Brick Road Poetry Press prize. Now, Michael has not made his own announcement yet, but since the news is posted on the Brick Road’s website, I thought I could make a note here just to say how excited I am about Michael’s upcoming collection. I read Blue Collar Eulogies last year, and I know his latest collection will be a great read. March comes in like a lion and goes out like a lamb. Isn’t that the old saying? Today, after a big melt and some flooding, it’s cold, but sunny. Hopefully, we won’t have any more surprise snowstorms this year! This March I am under deadlines. Not deadline. Not just one. Nope. But many deadlines. I am behind with a book review that I need to send off in a week or so. I am presenting at a conference at the end of the March, and I have only started to put that presentation together. Plus, I am presenting at another conference in April — and no, I haven’t even thought about that presentation, yet. Still, I have two deadlines (self-imposed) I am looking forward to…yesterday in the mail I received my copy of Robert Peake’s collection, Human Shade (published as part of the Lost Horse Press New Poets Series) and Brian Spears’ A Witness in Exile. I want to have them both read by the weekend — now that is my kind of deadline!